I posted this on my Instagram story earlier this week and I got a ton of comments from people who were like WAIT WHAT. so I thought I'd share it here too. The photography is suuuper high quality. Try not to be too impressed. 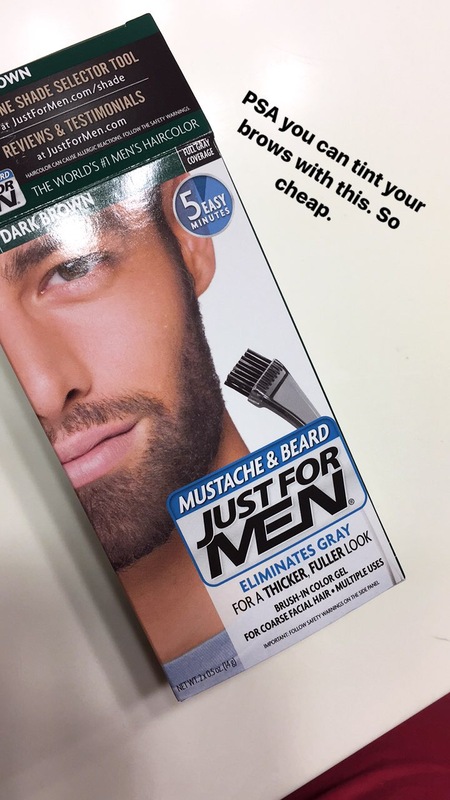 You can buy Just for Men pretty much anywhere. I got mine at Wal Mart for $6.97 and I'll get like 5 or 6 uses out of it so it's crazy economical. Mix it according to the package directions and swipe onto your brows in an upward direction (awaaaay from your eyes) using the included brush. Comb your brows into place using a clean spoolie, and quickly clean up around the edges with a q-tip. Let sit for 5 minutes or less, depending on how dark you want them. Before too long you'll have a v serious eyebrow situation going on. 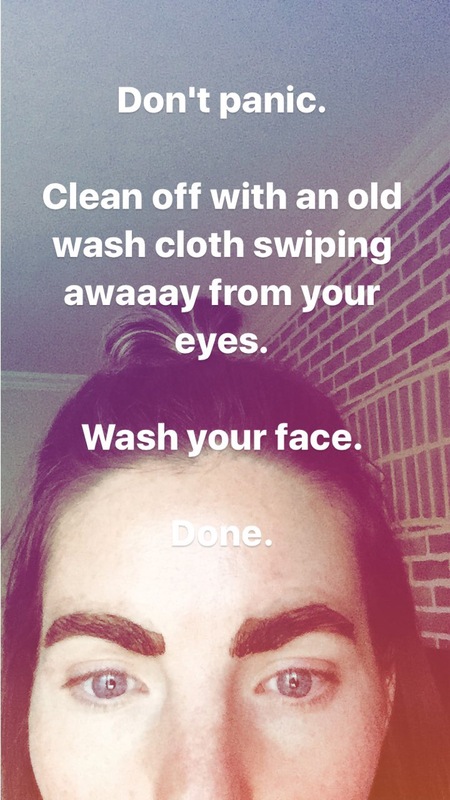 I try to do a really thorough job with the washcloth just to make sure no dye gets anywhere near my eyes when I wash. Then I usually hop in the shower and use my regular face wash to cleanse my face and brows. Keeping it classy with my workout clothes and topknot. But hey- my brows are done! Afterward I usually need to do some tweezing. The dye hits those baby hairs that normally don't show up (you can kind of see it above my brows in this pic) and I have to do some cleaning up. I'm going for an eyebrow wax in a few days so I didn't bother this time. Do you use/like the included brush? I do! This product develops crazy fast and I feel like the included brush is a really great tool for getting the product on my brows super quick. I load it up and swipe it on then really quickly comb them into place with a spoolie and use a q-tip to clean up the edges. Hopefully before my skin gets stained buuut not always. I definitely had a few dark spots up on top after this last time because I was taking pictures instead of focusing. It disappears after a day or two though. How do you like dying vs. Wunderbrow? I still looove Wunderbrow. It really depends on how low maintenance I'm feeling. 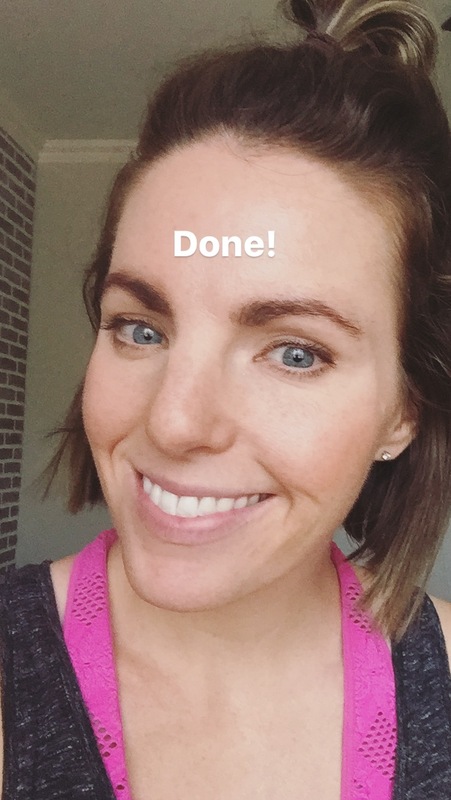 I used Wunderbrow all winter long because I wore makeup most days and Wunderbrow gives me the most polished look and helps fill in the bald spot on my right eyebrow and crummy arch on my left. Dying is great for me in the summer when I basically roll out of bed and into the pool. I'll actually still use Wunderbrow on the days when I'm wearing full makeup and want to look a little more "done." They serve different purposes for me. Can you use it more than once? Yes! The dye and developer come in little tubes with lids. You squeeze out how much you need then put the cap back on and save it for another day. One box of dye will seriously last me 5 or 6 months. Color selection is really limited- a couple shades of blonde, a few browns and a blackish, I believe. Just pick whatever is closest to your hair color and you should be good. I was between two brown shades and went with the darker of the two. For the first couple of days it does feel a bit like my brows are like HELLO THERE but it fades to a more natural looking color within a couple days and I love them for weeks. So there you have it. Cheap, quick and easy DIY brow tinting. Just in time for you to ignore your makeup bag all summer! Do they make it in lighter colors? Because girrrrl I would be in serious trouble if I put that shade on my eyebrows. Oops I forgot to include that info! YES there are lighter and darker colors.